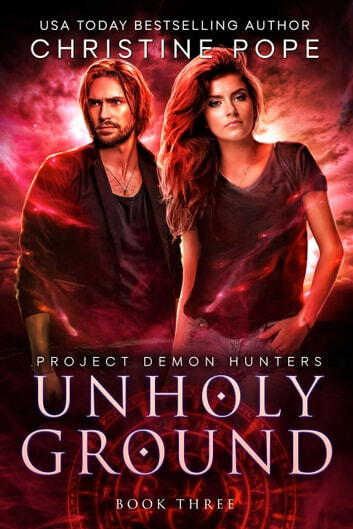 Christine Pope’s 3rd book in her new series “Project Demon Hunters” kept you on your toes and enthralled you as to what was to happen again. This author with her fresh and original approach gets you hooked on the story from page one of the first book to the end of this third book in the series. Audrey Barrett is strong, brave, independent and progressive, but is this enough to help Michael Covenant defeat the demon who has been making their lives miserable and isn’t through with them. Even though their newly found love got a slow start and came with lots of baggage was this enough to hold them together as they fought the exceptional and strong demon. I highly recommend this book but you must read the other two books in order to fully understand the entire series. Danger filled with restless spirits and ghosts, yup Audrey and Michael are in for it this time. 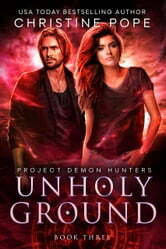 Unholy Ground is the third book in Project Demon Hunters. This was a great read, and filled with twists and turns that I wasn’t expecting. Nicely wraps up all the loose ends from the previous two books. A thriller for anyone who likes getting scared or spooked. Audrey and Michael are back for the nailbiting finale! They are still reeling after the sudden death of their sound engineer, Susan. The network has pulled their show but Colin is not about to just let their work go. He is a sneaky blighter! Michael and Audrey are still living in their little love bubble so to speak but their happiness is not going to last. Audrey is still seeing the ghostly remnant of the demons current host. He keeps giving her drips of information but is he leading her into danger or actually attempting to help her? As they investigate Susan and her life they come across some very disturbing information and end up undertaking a cross country adventure. But can Michael's unwavering belief in Audrey and their joint abilities really be enough to oust their demonic opponent once and for all? Audrey's home grown holy water worked once, but can it work again? I have really enjoyed this series. I actually managed to see the connection between Audrey and the apparition coming! Go Me!!! Otherwise a strong and intriguing story. Can't wait to see what happens in the offshoot with a certain ally!